Gulf Oil Spill Update: Swimming Advisory Lifted! 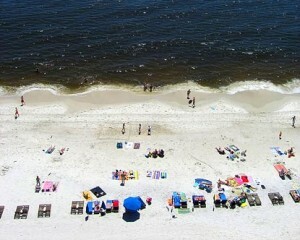 The Gulf Coast is clearing up just in time for family vacation! Like everyone along the Gulf Coast, the CVB is monitoring the clean-up of the Deepwater Horizon oil spill and relying on official updates from the Unified Command response team and local emergency management officials for information. We will continue to post confirmed updates on this page as they become available. The Alabama Department of Public Health lifted the swimming advisory for gulf waters off Gulf Shores, Orange Beach and Fort Morgan. However, the department warns that there may still be sporadic oil on or near the beaches and discourages individuals from entering the water if there is visible oil present. Click here to read the press release published by the health department. For the last several weeks, we have experienced little to no oil impact. Beach cleaning machines continue to rake the beaches nightly. Our beaches are open, clean, and swimming with caution is permitted. The process of permanently sealing the well is going well and may be complete with the next ten days. Since the well was capped several weeks ago, the outflow of oil appears to have stopped. If double red flags are being flown at a beach area, it means the water is closed to swimming. In Gulf Shores it is illegal to swim when double red flags are in effect. The Alabama Department of Conservation & Natural Resources has issued an “Idle Speed Only, No Wake” order for the following back bay areas: Alabama waters south of a line running from the southernmost tip of Bear Point to the eastern shore of the mouth of Ono Harbor. This includes Bayou St. John, Terry Cove, Terry Cove Harbor, Cotton Bayou, Perdido Pass and all canals entering these waters. However, other areas remain closed to all recreational vessels and watercraft. Cotton Bayou boat launch has been reopened and is included in the “Idle Speed Only” area. All Alabama state waters are open to recreational catch-and-release fishing and the Alabama Department of Conservation & Natural Resources has reopened areas west of the Dauphin Island bridge and north of Dauphin Island to commercial and recreational fishing. This includes all gulf waters out to the three-mile state/federal line. Anglers are reminded to stay clear of booms and booming operations, all working vessels, and areas with visible oil and/or sheen. The pier at Gulf State Park is also open for catch-and-release fishing. For full information, click here. The City of Gulf Shores has temporarily waived parking fees at public beach areas. The West 6th Street and Little Lagoon Pass public access and parking areas remain closed for an undetermined length of time. These areas are being used as work sites and staging areas for beach cleaning operations. The same is true for the parking area at Florida Point beach access. The staging area that was installed at Gulf State Park Pavilion has been cleared and the area is now fully accessible to the public. If you have questions about conditions at a specific property location, please contact your rental management agent for accurate and up-to-date information. According to NOAA, tarballs DO NOT pose a health risk to the average person. However, beachgoers are advised not to pick them up or bury them and asked to report any sightings. To report sightings of oil or tarballs on the beach, please call 866-448-5816. To report oil impacts to wildlife, contact 866-557-1401. Fishing of any kind is still prohibited in the closed area of federal waters, which currently includes an area off shore from Louisiana to Cape San Blas, Florida. To view a map of the closed area, click here. A system of piping that was installed at Perdido Pass to funnel oil away from back bays has now been dismantled because officials say oil is no longer a threat to that area. For detailed information about the entire incident, including spill trajectory maps, visit the NOAA or Deepwater Horizon response sites.